When the big book of Sonoma county history is writ, there should be a special chapter on some of the remarkably dumb business ventures that were tried here and flopped spectacularly. Near the top of the list would be Jack London’s eucalyptus obsession, which caused him to squander a fortune. London wasn’t alone in the mistaken belief that blue gum trees would be a valuable cash crop but he was probably the largest investor, planting about 100,000 seedlings. The trees proved worthless (plus a fire hazard, to boot) and just made London’s Beauty Ranch stink like cheap menthol cough drops. London only wasted money with his dream of a eucalyptus plantation, but in the 1870s a Glen Ellen farmer inadvertently launched an environmental disaster. In 1871 Julius A. Poppe set up a fish farm but he didn’t stock it with Steelhead or Rainbow Trout or another native fish; instead, he imported common carp all the way from Germany. Often called a “trash fish,” common carp could be the eucalyptus of the piscatorial world. They grow big very fast, spawn prolifically and crowd out any other species in its vicinity. And like blue gum trees, they are mostly worthless – very difficult to clean as well as eat because of their tiny bones, not to mention being also an acquired taste. Yet it was a traditional food for German/Central European immigrants and carp ponds became a local fad, with Poppe selling breeding fish to more than a dozen farmers. Big winter storms caused some of the ponds to overflow and by the middle of the decade carp were found in creeks, rivers and the Laguna. That was the death knell for commercial carp farming in Sonoma county, although Poppe also sold stock to farmers in Southern California, Hawai’i, and even Central America. But there seemed to be an upside to the release of the fish into the wild; carp fishing in the Laguna became a popular sport and a tourist draw. In 1879 the State Board of Fish Commissioners even supported carp by introducing catfish, which would eat the “water dogs” – newts of the now endangered tiger salamander – which preyed upon juvenile carp. Shift forward fifteen years and attitudes are flipped. Sportsmen realized the carp were forcing out trout and other types of fish which people actually liked to eat, while carp were also reducing the food supply of migratory ducks. Thus in 1896 the state introduced largemouth bass into the Laguna to eat the carp (“all the carp which are now in the stream will eventually be destroyed, as black bass are death on carp” – Sonoma Democrat, 4/24/1897). Two years later the bass itself had become such a nuisance that someone began trying to wipe them out with dynamite: “Every few days a stick of powder is touched off under the water and as a result dead bass in great quantities can be seen floating on the surface,” reported the Sebastopol Times in 1898. What a fine example this was of the Unintended Consequences Law; in less than a quarter century, a modest side business of a few farmers ended up wrecking an entire ecosystem. Even today, catfish and bass appear to be in all our local waterways, while Mr. Poppe’s carp can still be found in Green Valley Creek, Estero Americano, the Petaluma River and elsewhere. Although the carp and eucalyptus projects didn’t make any money (or at least not much), at least they moved the ball forward; Poppe successfully imported fish from Germany and sold some. London indeed planted a carpload of trees which no one wanted. But John M. King badly fumbled between the dreaming and the doing. John M. King wanted to become the first steamboat captain on the Russian River. Captain King built the Enterprise just downstream from Heald and Guerne’s lumber mill, which is to say a mile west of today’s Safeway store in Guerneville. He also built two barges to tow with his steamer; he had a contract with the mill to carry shingles and lumber to the mouth of the river, where presumably an ocean-going ship would connect to take the barges down to San Francisco. But before he began barging or making his quixotic run to Healdsburg, King wanted to show off a bit. King took out an ad in the Flag announcing an “excursion” from Guerneville to Duncan’s Mills. “…The trip will afford one continuous panorama of the most beautiful and romantic scenery,” he burbled, as well as the chance to see lumbermen’s camps – which seems to me a bit like the SMART train trying to draw riders by promising scenic views into junky backyards and homeless encampments. Alas, a cancellation notice quickly followed. “The excursion trip is postponed for a few days, owing to an unavoidable accident which will be soon remedied, when all will be right again.” As the summer and autumn of 1869 passed, King continued to tinker with his boat and just before Christmas the Flag reported that he was actually towing cargo. 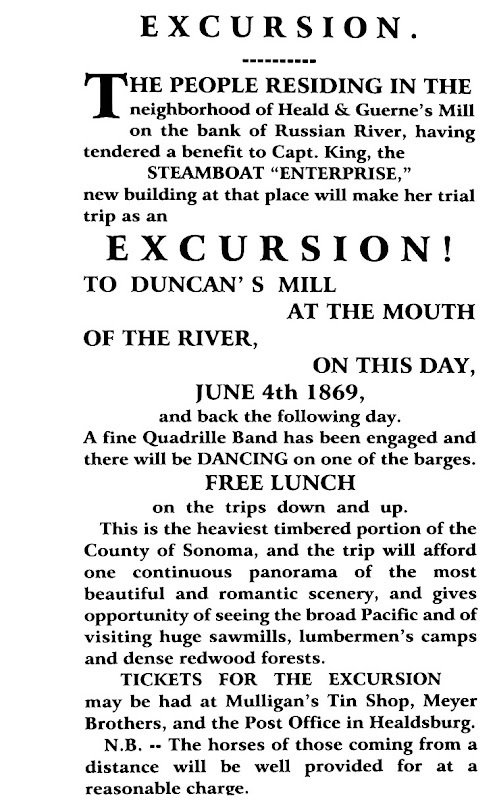 The excursion to Duncan’s Mill and back (with dancing on the barges in tow) supposedly happened Dec. 23-24, but nothing further appeared in the paper. Then sometime after the New Year with the river around its winter peak, he made a run for Healdsburg. He sank two miles past Guerneville. “The indomitable Captain has got her afloat again,” reported the Flag a few weeks later. King was aided by someone from the Mare Island Navy Yard as well as fifteen men clearing obstructions in the water. “Capt. King’s steamer, ‘Enterprise,’ will probably reach Healdsburg today. as she is now but a short distance below town,” the paper reported on March 24. He didn’t. The ship ran aground again and this time could not be budged. It stayed wherever it was for months, maybe years. * The 1976 case was Hitchings v. Del Rio Woods Recreation & Park District. One of the lawyers in the 1886 Wright v. Seymour suit was this journal’s favorite antihero, James Wyatt Oates. The Steamboat “Enterprise.” — This boat now being built at Heald’s Mill by Capt. John M. King, will be launched next Saturday the 15th. The machinery is all aboard now and the boat will be completed within two or three weeks, when she will make an excursion to Duncan’s Mill on the Coast, going down one day and returning the next. As many of our citizens will want to join the excursion the Flag will give timely notice of the day set for it to come off. The livery stables will run stages down to the landing twelve miles from Healdsburg. Capt. King has been running a barge on the river, drawing from fourteen to twenty-six inches, according to the load. He has made six round trips from Heald’s Mill, carrying, in the aggregate, 200,000 shingles and 20,000 feet of lumber, besides considerable farm and dairy produce. He has built another barge drawing only twelve inches when loaded. He is now building the “Enterprise” to tow these barges. The boat is 50 feet long; 10 foot beam on the bottom and 14½ on deck; Engine 15 horsepower; draught 12 inches; depth of hull 44 inches; dip of paddles (stern wheel) 10 inches. She is built in a superior manner and fitted up with a cabin and all necessary conveniences for carrying passengers. Capt. King having a contract for carrying the lumber from Heald & Guern’s Mill the regular trips of the boat will be between that point and the Coast. In the season of high water the Captain expects to run to Healdsburg. This would give us cheap freight between Healdsburg and San Francisco while the mud road to Petaluma was at its worst. We hope Capt. King’s enterprise in building the “Enterprise” will be richly rewarded. Particular attention is likewise invited to the advertisement of Capt. John King, of the new steamboat “Enterprise.” He proposes an excursion which will give every one an opportunity to enjoy the delightful scenery along the navigable portion of Russian River, and also to visit the coast on the first steamboat ever built or run on this river. We hope the Captain may have an encouraging benefit on this occasion. His pioneering energy should be well rewarded. It is twelve miles we believe to the Mill from which the excursion starts. Read Capt. King’s advertisement carefully once more and decide whether you can afford to lose the trip. — We learn from Capt. King, and you will learn from our correspondent “Visitor,” that the excursion is postponed for a few days. Be ready for another announcement. Letter from “Big Bottom.” Big Bottom, May 29th, 1869. The steamer Enterprise, Capt. John King, has steam up again and is running. It will make a trial trip to the mouth of the river this week. The Capt. has constructed a dam and lock, which gives the river a three foot rise above the dam. He will open the lock and let the boat ride through to the sea on the accumulated waters. — Capt. King says that three locks would be sufficient to make the Russian River navigable to Healdsburg the whole year; also that we may expect to see his boat up here the first Fall rains. We visited the steamer Enterprise, lying one mile below the mill. Capt. King is quite confident that he will visit Healdsburg by steam before Christmas. Says he intends next Summer to make regular trips – three times a week — from the month of the river to Healdsburg. Next Saturday he intends making his first trip to the mouth of the river. Capt. King of the steamer Enterprise was in town last week having some repairing done to the machinery of his boat, which will soon be skimming over the waters of Russian River. A Success. – The new steamer Enterprise recently constructed by Captain King for navigating the Russian River, made her trial trip on the 23d ult., and we are glad to learn, proved a success. Her speed was some ten miles an hour. The Steamer Enterprise. — We are pleased to learn from Mr. J. W. Bagley that Capt. King’s boat, the Enterprise, is now successfully running on Russian River. She left Heald & Guern’s Mill on the 16th with several passengers for Duncan’s Mill, with barges in tow loaded with charcoal. On her next trip she will carry hoop poles and several thousand Christmas trees for San Francisco. At last, after several unsuccessful attempts, Russian River is navigated by a live steamboat, and we hope, when the river rises, to see the little vessel throw out her bow lines and stern lines and spring lines to the Healdsburg wharf! Captain King is entitled to great praise for his indomitable pluck and perseverance under difficulties and we hope his “Enterprise” may prove a great success. Since the above was in type we are informed that the boat will leave Heald & Guern’s Mill today at 12 o’clock on a pleasure excursion to Duncan’s Mill and return at noon tomorrow. Fare down and back, $2.50. Two barges fitted up for dancing will be in tow. Mr. Hudson’s bill declaring Russian River navigable and providing for its improvement, has passed the Assembly. This is intended to encourage and protect the indomitable enterprise of Capt. John M. King, who has built a steamboat to navigate Russian River, and it will no doubt become a law. It will be of great benefit to our county. The Enterprise. – Some weeks since Capt. King attempted to make a passage to Healdsburg with the “Enterprise,” but a little above Heald and Guern’s mill the pilot backed the boat upon a snag and sank her. This occasioned delay and considerable expense, but the indomitable Captain has got her afloat again and with the experienced help of his friend Capt. Parker, of the Mare Island Navy Yard, he will make the first voyage to Healdsburg as soon as some obstructions can be removed from the river, which he is now engaged in doing, with a force of fifteen men. The boat is now above the mouth of Mark West creek about ten miles below Healdsburg. The captain has bought new sixty horse power engines for her and he will keep her here when she comes up until they are put in. Capt. 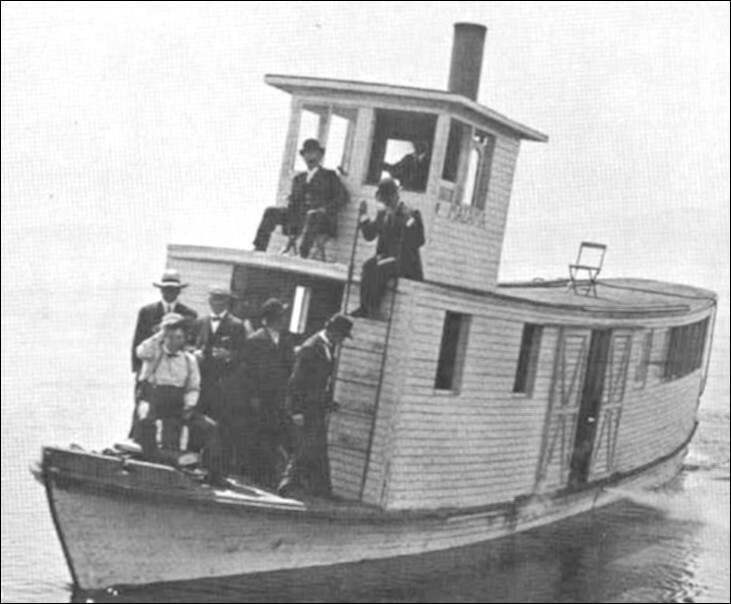 King’s steamer, “Enterprise,” will probably reach Healdsburg today. as she is now but a short distance below town. A Card From Mr. Heald. Eds Flag: — If I may be permitted the space in your paper to correct some errors in the card of John M. King, in your issue of May 5th, I will be thankful for the favor, as it seems to throw the blame of the failure of his boat where it does not belong. I think, however, the fact of his trying some four weeks to get the boat to Healdsburg over the shoals, with the river falling every day, without any probability of a rise till next December, and only making twelve miles, should convince any one that the “Enterprise for the present is a failure,” and Heald and Guerne not wholly answerable tor it, if they had lately attached the boat; but the facts are, that Heald and Guerne have not attached the boat as represented by King, and, as to his dog “Gipsie,” I never as much as knew he had such a dog. Heald and Guerne do not wish to “break” J. M. King, nor to “keep him broke,” but suppose we will have the pleasure of seeing the “Perseverence” when she comes along. Thos. T. Heald. May 8th. 1870. Life among the Lumbermen – How the Redwoods are Cut and Hauled, etc. For many in Sonoma County, the results of the election were unthinkable; voters had approved a county ordinance for prohibition, banning sale of alcohol anywhere outside of major towns. Of course, exceptions could be made – if you had the right connections. At the stroke of midnight, January 1, 1913, every roadhouse in the county lost their liquor license. But anyone who presumed those 110 rural saloons would close or only serve soft drinks were mistaken; a couple of days later the Santa Rosa Republican commented, “…in some roadhouse localities the indications were that frequently the ‘hard’ quality leaked into the ‘soft’ glasses.” Congrats, voters – you just launched the speakeasy underground culture, and with it, opened new doors for political corruption. There were also two test cases quickly filed by County District Attorney Clarence Lea. One was against a man named Ellsworth who had a nondescript roadhouse just outside Santa Rosa city limits; the other charged a man named Connolly who owned the Hotel Altamont in Occidental, which was the premiere drinking spot in West County outside of select Russian River summer resorts. Ellsworth was arrested for violating the ordinance and spent time in jail. Connolly was granted a liquor license by the Board of Supervisors because he filed an affidavit with the county clerk attesting his joint really did have 35 rooms, even though the District Attorney’s case – months away from a court decision – was based on the fact Connolly was short on the required number of beds. District Attorney Lea told the Supervisors the new law was filled with loopholes. It simply counted how many rooms, regardless of the character of the establishment (he was presumably worried about brothels); there was no specified fine or other penalty for breaking the law; and probably most significant of all, it placed no limitation on the power of the Board to issue licenses. Already the latter was problematic; besides Connolly’s Hotel Altamont, liquor licenses were immediately issued to thirteen other places deemed to have thirty-five rooms, although it seems likely that odd number was chosen by the prohibitionists because they presumed few if any places would qualify. Two particularly notorious roadhouses tried to sneak around the law. The Riverside, a couple miles south of Petaluma, claimed it was a “blind pig,” where customers supposedly pay to look at an odd animal or other attraction and given a free drink. The other was Jacob Koblar/Kobler’s place near River Road which was probably the main reason for the earlier West County crackdown. His lawyer now said the place was the private “Mt. Olivet Social Club,” with a 35¢ membership and organized “for the moral and intellectual” uplift of the members. Um, no, sayeth the judge. Pay the $200 fine, please. Meanwhile, the sheriff and his deputies were kept busy hunting and busting speakeasies. Only one hotel/resort had its liquor license revoked, and it was because a deputy testified “the resort is visited by dissolute men and women with the approval ot the proprietors and that the place is conducted in an immoral manner,” which means prostitution. That was Louie Parente’s joint near El Verano, previously introduced here in “THE VILLAGE OF VICE IN THE VALLEY OF THE MOON.” A decade later his resort would be raided like clockwork by prohibition agents, and another ten years beyond that it would become infamous as a hideout for gangsters like Baby Face Nelson – but in 1913 Louie’s attorney told the Supervisors he was wrongly accused: “According to the testimony of the defense the place was the best conducted of any in the country and the employees were almost saints themselves…” reported the PD. As 1913 wore on, the Board of Supervisors liquor license hearings were probably the best show in town, the room packed with both supporters of the applicant and teetotalers. To oppose a Freestone license, women brought a large crowd of little girls dressed in white and carrying banner and pennants marked, “We Want Dry.” At another hearing, a petition was presented asking for more licenses in the Sonoma Valley. A PD reporter commented on one meeting, “…a number participated in the arguments, and at times considerable excitement was created and feelings engendered.” In other words: Angry shouting. Then there was the attempt to recall Henry Weise, Supervisor for the Sonoma Valley. The petition claimed he was “guilty of misconduct in office” for failing to oppose roadhouses with sufficient vigor. Behind the recall effort was Guy J. K. Bigelow of El Verano, apparently the loudest voice on the temperance side. Bigelow was saying Weise was a drunk and had accepted “a sack of money” from Fetters Springs to obtain a liquor license. Weise sued him for defamation of character and slander, demanding $65,000 damages. The recall failed by three to one and when the slander suit went to court the next year, a jury found Bigelow not guilty because he claimed he was only repeating rumors. Bigelow testified he heard Weise had been given a $1,750 bribe. “I said I did not believe the report and that if it was true I would be helping put Weise in stripes.” Well then, obviously Bigelow meant no harm. By the end of 1913 it was apparent the anti-roadhouse ordinance had accomplished little aside from picking off the smallest hole-in-the-wall places where the owner had no political clout. Instead of 110 roadhouses there were now 24 rural hotels serving drinks. At the close of 1914 there were 46 licenses, and 52 the next year. The Board of Supervisors did pass a stricter county liquor ordinance. Now rooms had to be built of wood or permanent material and contain 500 cubic feet of air space and eight feet of window space. Liquor could not be sold within fifty feet of any dance hall while a dance was in progress, unless the hall was on different floor of the building. Anyone selling both soft drinks and liquor had to keep the booze stored at least ten feet away from the building. Silly? Probably, but it gave the Mrs. Grundys their token legal victories – even while the Supervisors were approving more and more liquor licenses because hotels the size of a city block were supposedly springing up in places like Agua Caliente and Monte Rio. Geyservllle had two, and there was another application waiting. * The Louvre saloon was only steps away from the front of the train station on the corner of Railroad/Main Street and Armstrong Woods Road, which was then still known as Cinnabar Avenue. The building now at that 16200 Main St. location is currently home to a Community First Credit Union and is not the old saloon structure, but a complete rebuild from the 1960s following an arson fire. The Pool brothers partnership ended in 1914, when John Pool sold his interest to Charles, who continued running the Louvre with Joe Montoya. In 1916 the liquor license was transferred to Bill Nolan, owner of the Guerneville Hotel. Through the 1920s Nolan and his wife advertised the hotel was first “run in conjunction with Hotel Louvre,” then later promoted their operation as the “Guerneville Hotel and Louvre Annex.” The Guerneville Hotel was catty-cornered from the Louvre on the other side of Armstrong Woods Road. Much thanks to John Schubert for help in sorting out those locations and histories. A number of citizens, among which were several ladies, met at the office of Rolfe L. Thompson in this city last evening, and organized for the purpose of conducting an election to abolish the road houses in Sonoma county. An ordinance was drafted which will be presented to the Board of Supervisors under the initiative or direct legislation law. It is the purpose of those at the meeting to have the proposed ordinance presented to the board in time so that it can be submitted to the voters at the general election to be held in November. Besides those present from Santa Rosa and vicinity, a representation was in attendance from Sonoma. After adopting the name of “Anti-Roadhouse League,” Dr. J. W. Scamell was elected president, G. L. Reed secretary, Rolfe L. Thompson and Ross Campbell attorneys. A committee was appointed to solicit membership, and to attend to the circulation of the petition to secure the requisite number of signatures in order that the ordinance may be submitted to a vote of the people. The league is formed solely for the purpose of eliminating the road houses from the county, and is not dominated by any religious sect or temperance organization, and does not propose to interfere with licenses now held by hotels or summer resorts now in business or which may hereafter desire a retail license. No person, corporation, firm or association shall sell, or engage in the business of selling, offering for sale or giving away distilled, fermented, malt, vinous or other spiritous or intoxicating liquors or wines or beers in any portion of Sonoma county lying without the corporate limits of any city or town of said Sonoma county, except such person, corporation, firm or association engaged in the business of conducting a bona fide hotel, having at least thirty-five separate sleeping apartments properly furnished for the accommodation of guests, and having dining room at which meals are served at regular hours to boarders and the traveling public. The anti-roadhouse ordinance, carried at the election held in Sonoma county a week ago last Tuesday, is null and void. Such is the opinion of a number leading lawyers here, and strengthened by a decision handed down on Thursday by Presiding Justice N. P. Chipman of the Appellate Court of the Third district at Sacramento. The court’s decision is right, they say, and there is no doubt whatever but that the election in this county on the matter is invalid. The opinion of Justice Chipman upholds the Wyllie Local Option law against interference from the initiative law, and Charles Zany, who was arrested near Modesto, Stanislaus county, charged with violating a county initiative ordinance, making it unlawful to sell liquor, was liberated from jail. The Court held that the Legislature did not intend by the initiative and referendum to bring about such confusion or to destroy the operation of the local option law. The Hon. Thomas Geary, who has been looking into the matter very thoroughly, having been requested to furnish an opinion as to the validity of the ordinance, when told of the Appellate Court decision quoted above, stated that there was no doubt in his mind but that Justice Chipman was right and that the decision bears directly upon the Sonoma county situation. So certain was he of the invalidity of the ordinance that yesterday he was considering a course to follow in testing the matter in the courts. The above resolution was passed at Monday’s meeting of the Board of Supervisors, and will be read with considerable interest. Unless the suit now pending before the courts to determine the validity or invalidity of the anti-roadhouse ordinance by the first of January all places other than hotels with thirty-five rooms will have to close their doors, as the resolution passed by the Supervisors above quoted will preclude the issuing of the usual number of licenses which date from January 1. District Attorney Clarence F. Lea filed a complaint yesterday in Justice A. J. Atchinson’s court against E. N. Ellsworth, who runs a roadhouse on the outskirts of town on the Healdsburg road, alleging that he is conducting his place in violation of the anti-roadhouse ordinance, which carried by initiative at the November election. In this proceedings the validity of the ordinance will be tested and the means of prosecuting under it, should it be sustained by the higher courts. It will also ascertain whether the power for punishment on violation is not already provided for under the old and present existing ordinance passed by the Board of Supervisors, The contention of the District Attorney is that prosecution can be sustained under the old ordinance for violation of the new. District Attorney Lea also stated that there is nothing In the report that the civil suit filed in the antl-roadhouse matter against John D. Connolly of Occidental, will be dismissed or dropped. Mr. Connolly has not thirty-five rooms as prescribed by the ordinance in his hotel at Occidental, but at the time he filed application for the renewal of the license, which was prior to the opinion of the Appellate Court, which cast some cloud on the validity of the initiative ordinance, he was contemplating putting on the additional rooms, having them ready by January 1. Mr. Connolly’s attorney will file an answer to the complaint, and it will be admitted that there are not the thirty-five rooms as contemplated by the ordinance. The case against Mr. Connolly is also a test of the anti-roadhouse ordinance. Considerable interest was manifested Wednesday in the hearing by Superior Judge Thomas C. Denny of the arguments hearing on the validity or invalidity of the anti-roadhouse ordinance which was carried in this county at the November election and which, as is well known, prents the issuing of liquor licenses to other than bona fide hotels, with thirty-five rooms. The discussion that has arisen since the adoption by the voters of this county or the ordinance referred to has aroused attention of people all over the county, and in consequence it was not to be wondered at that the courtroom was thronged at the hearing of the matter Wednesday. The courtroom audience was composed of a number of the men vitally concerned in a business way in the outcome of the court’s decision–hotel and resort keepers and saloon men, and also some of those who were strong advocates of the crusade against the roadhouse in Sonoma county. The law bearing on the situation involved was thoroughly presented. Many citations from authorities established in prior Supreme court, Appellate court and Superior court decisions, were read by counsel, and the powers vested by the Constitution were also called up. The matter was brought into the Superior court judicial determination by the filing some time since of a complaint against John D. Connolly, proprietor of the Hotel Altamont at Occidental, setting forth the fact that Mr. Connolly’s hotel did not contain the required thirty-five rooms specified in the provisions of the anti-roadhouse ordinance. This was the suit being argued on Wednesday. The anti-roadhouse ordinance in Sonoma county, adopted by the people at the November election, was upheld by Judge T. C. Denny in the Superior Court on Thursday when he gave judgement on the pleadings and in favor of the plaintiff. The jurist decided the case immediately after the conclusion of the arguments. He stated that it was at first his intention to have taken the matter under advisement, but inasmuch as an appeal would be taken to the Supreme Court he would render a decision forthwith without going into the many authorities submitted by counsel, thus saving time. The Court’s ruling was in the suit of the People against John D. Connolly of Occidental, proprietor of the Hotel Altamont in that town. The action was brought merely for the purpose of testing the validity of the initiative ordinance which provides that liquor licenses may not be issued outside of incorporated towns except for bona fide hotels with thirty-five sleeping apartments. After passing upon the Connelly case Judge Denny also made an order in the case of the People vs. Ellsworth, who keeps a saloon on the Healdsburg road, near this city, denying the writ of habeas corpus applied for, and remanding Ellsworth to the custody of the Sheriff. An appeal will also be taken to the highest court in this case at the same time as one decision will settle both cases. District Attorney Clarence F. Lea stated Saturday that on January 1 all saloons and roadhouses in Sonoma county, outside of incorporated cities and towns, will not have licenses to run and dispense Intoxicating liquors. Their licenses expire on January 1, and as they have not been renewed the owners will be liable to prosecution if they sell liquors other than soft drinks. District Attorney Lea stated further that there are some people in the county whose licenses run on into next year. He says they must also close with the rest on January 1, or be liable to prosecution, and in case of the upholding of the antl-roadhouse ordinance their failure to do so would be a ground for revocation of their license. As is well known, pending the determination of the validity or invalidity of the anti-roadhouse ordinance by the Appellate Court, the Supervisors decided that no more licenses should be issued. The matter is now in the higher court, but as yet no date has been set for the argument. It will probably be disposed of at at an early date. But until it is Sonoma county outside of incorporated towns, will be “dry” as far as the sale of intoxicating liquors is concerned after Wednesday. At midnight last night all over Sonoma county the dispensing of intoxating liquors outside of incorporated towns in saloons, roadhouses and resorts ended for the present at least until the Supreme court shall have determined the validity or invalidity of the anti-roadhouse initiated by the people at the November election. The reason for the closing of the places in the outside territory is because the licenses expired at midnight last night and no new ones have been issued by tho supervisors in accordance with their resolution to await the decision by the highest tribunal in the State on the antl-roadhouse ordinance already mentioned. … The Connelly case is not disposed of, but the points urged in the Ellsworth case were practically the same as in the Ellsworth habeas corpus matter. January 1, the one hundred and ten road houses and saloons out of incorporated cities in Sonoma county, for the time being, went out of existence. That is, they sold only “soft drinks.”However, in some roadhouse localities the indications were that frequently the “hard” quality leaked into the “soft” glasses. Supervisor Henry Weise presented a lengthy resolution of the afternoon session of the Board of Supervisors on Monday setting forth the “injury being done to the legitimate business In the county” by the refusal of the old Board in declining to grant any of the hotels a liquor license, and closing with a declaration that such places as were entitled to a license under the recently adopted Initiative Ordinance should be granted it. This was followed by a motion granting licenses to J. D. Connolly, W. L. McCray, E. E. LaFranchi, L. B. Selenger, John Lopus, F. M. Haley, Morris Levy, Boyes Hot Springs, (a corporation); H. P. Trusty, Theodore Richards, E. Forni, W. H. Wilson, P. L. Crlblet and Geo. Fetters, they having filed affidavits with the county clerk that they were bona fide proprietors of hotels with thirty-five or more rooms. On filing sworn statements with the county clerk that they were proprietors of bona fide hotels, now under construction, which will contain thirty-five or more rooms, liquor licenses were also granted H. Hoerner, D. J. Crone, Louis Larnotte and Parenti Brothers. District Attorney Clarence F. Lea, whose duty it is to enforce all of the laws, filed a communication with the Board of Supervisors Thursday in which he recommends the passage of an ordinance at this meeting providing in substance that any person who sells intoxicating liquors contrary to any existing ordinances of Sonoma county, whether enacted by the Board of Supervisors, or by vote of the people, be made a misdemeanor, and punishable as such. …Fifth: It fails to discriminate along the line of decency or indecency, morality or immorality. The question of how many rooms the dealer has does not determine this question. Much more important than the number of rooms are the question as to whether or not the liquor dealer is a fit person, or his place a fit place for a saloon. A jury in Justice Atchlnson’s court found Charles Guidi guilty of selling liquor without a license in dry territory after a trial which lasted practically all day. Assistant District Attorney George W. Hoyle prosecuted the case and Guidi was defended by Thomas Jefferson Butts. Lawyer Butts announced after the trial that he would take an appeal to the Superior court for a ruling on a question which he says is involved, as to whether the county ordinance is in force or what was repealed by the initiative ordinance. The question is said to he somewhat hazy. Justice Atchlnson postponed sentence of the accused until Tuesday, and in the meantime Lawyer Butts will take his appeal. Attorney T. J. Butts filed a bill of exceptions yesterday in the case of the People against Charles Guldi of Kenwood, convicted by a jury in Justice Atchinson’s court of selling liquor in violation of the initiative dry ordinance and fined $l5O. The attorney for the defendant will base his appeal entirely on the validity of the action of the court in accepting the conviction under the initiative ordinance and fining him under the county ordinance. It is claimed that the initiative ordinance repealed the county ordinance in its entirety, leaving the law without a penalty. Two other cases from violation of the law for selling liquor were up in the Superior Court yesterday. These were both under the old county ordinance and the Wylie local option law in Supervisor Green’s district. C. J. Curtis of Graton, charged with the sale of liquor In “dry” territory, had an information filed against him in open court by the district attorney before Judge Seawell and the arraignment was set for March 24, next Monday. The case of Hugh McConnell of Forestvllle, recently arrested on a similar charge, was given similar treatment. These two cases will probably be tried very shortly and will be the first to be heard under the Wylie law in Sonoma county. District Attorney Clarence F. Lea says there has been much misapprehension by the public relative to the Charles Guidi case and what the Superior Court ruling on the appeal means. Guidi was arrested after the Initiative ordinance had been adopted at the special election and was operative under the old county ordinance passed by the Board of Supervisors. He was convicted of selling liquor without a license and fined under the penalty clause of the old ordinance. The attorneys for Guidi contended that after the initiative ordinance had been adopted it superceded all liquor license ordinances previously passed by the supervisors and left the county without any penalty for selling liquor without a license as the initiative ordinance contained no penalty. The district attorney held that the initiative was simply an amendatory ordinance to the previous liquor license ordinance of the county dealing with only one phase of the business and that all old ordinances not in direct conflict with the new law were still operative. The Board of Supervisors devoted practically the entire day yesterday to considering liquor licenses, saloons and roadhouses, There was a large attendance of citizens from various sections of the county brought out by hearings fixed for the day on petitions for licenses and protests against the same. Attorneys Rolfe L. Thompson and E. W. Kilgore were present representing the protestants in several cases, while Attorney A. B. Ware appeared for several petitioners. At the morning session a number participated in the arguments, and at times considerable excitement was created and feelings engendered. The afternoon session passed off quietly. The applications of John Walk and Sam N. Cowan of Kenwood, and N. Bacci of Rincon Hill, to which protests had been made, were taken under advisement. Licenses were granted to James A. Serres of Alder Glen Springs, Fred Tartter of Fulton, James E. McKenna, Plantation House, and L. Bevier of Guernevllle. It was also Voted to grant to Morris S. Enio, at Sea View; A. W. Ellingwood, at Penngrove, and E. A. Mason, at Geyservllle, upon their furnishing good and sufficient proof that they had complied with the terms of the county initiative ordinance, in reference to having 35 furnished rooms in their hotel. A new feature of the license question was injected into the situation with the presentation of a petition by residents of Sonoma and vicinity asking the board to rescind its resolution of February 7, limiting the number of licenses to be issued in the district between Eldridge and Shellville to 11 and asking the board to hear the petition for licenses from Paul Varmucci, Mary Farrell, H. P. Mathewson and George Garoni. …Kenwood was represented at the hearing by a very large delegation. Among the number were [10 people]. The Guernevllle section was also well represented at the hearing of the petition from that district. Among those present were George E. Guerne [and 10 other people]. Deputy Sheriff J. F. Ryan of Sonoma swore to a complaint Thursday against the Pasente Bros., who conduct a resort near El Verano, in an effort to revoke their liquor license. The firm also conducts a well known resort on Pacific avenue, San Francisco, and many of the patrons of the latter place are harbored at the El Verano resort, according to the officers. The complaint will be heard by the Board of Supervisors. It is charged that the resort is visited by dissolute men and women with the approval ot the proprietors and that the place is conducted in an immoral manner. There has been much complaint regarding the resort from those residing in the neighborhood and the officers, and now it is expected that a case will be presented to the Supervisors which will warrant the revoking of their license. Superior Judge Emmet Seawell made an order in the Superior court Thursday afternoon whereby fifty-eight quarts of whiskey, 420 pints of beer, and some fixings, found on the premises of Hugh McConnell at Forestville when a search warrant was made for evidence to support the charge that McConnell was violating the local option law, will be destroyed. The court also ordered the destroying of 200 pints of “near beer,” two cases of real beer and two cases of malt found on the premises of C. J. Curtis at Graton. McConnell entered a plea of guilty of violation of the law in the Superior court on Thursday afternoon and Judge Emmet Seawell imposed a fine of $150. The fifty-eight quarts of whiskey will be used medicinally at the county hospital for the patients needing such nourishment as prescribed by the county physician. The other liquor has found its way down the sewer. The validity of the ordinance is practically sustained in all its details in the opinion of the highest tribunal which was rendered in the Ellsworth case. Ellsworth, who kept a roadhouse on the Healdsburg road, just outside the city limits of Santa Rosa, was arrested for violating the ordinance and was punished. The contention was made that the new ordinance could not hold him as it did not contain any penalty clause. In passing upon this point the court was also referred to others. The matter is one of such general interest in Sonoma county that The Press Democrat herewith presents the opinion of the Supreme court in full. Armed with search warrants issued by Justice of the Peace Harlow of Petaluma, Sheriff Jack Smith and Deputy Sheriffs McIntosh and Rasmussen entered the Riverside resort about two miles below Petaluma, and took possession of a quantity of beer and whiskey. H. F. Arenburg, the proprietor of the resort, was placed under arrest and taken before Justice Harlow, and was admitted to bail in the sum of $250 cash, which he furnished. His preliminary examination will be held within a few days. Sheriff Smith found the blind pig well stocked with beer. A quantity of whiskey was also seized and loaded on a van. It was taken to Petaluma and later in the day shipped to this city, where it will be held as evidence and later confiscated. The Riverside was a notorious resort in the days before the anti-roadhouse ordinance went into effect. It is on the San Rafael road about two miles south of Petaluma. ARE COTTAGES AND TENTS PART OF HOTEL BUILDING? The Superior Court of this county will pass upon certain conditions Imposed by the county initiative ordinance that abolished roadhouses and provided that no license could be Issued other than to bona fide hotel, outside of incorporated cities, with thirty-five separate sleeping apartments. The Court will construe the ordinance and will decide whether tents or cottages that now in some instances make up the thirty-five rooms suggested in the ordinance, are permissible, or whether it means that all the rooms must be under one roof. A contention has been raised that either comes under and is sufficient obligation to meet the ordinance. Tn the Superior Court on Thursday the People of the State of California is plaintiff, and P. S. Newton, proprietor of a hotel on the Russian River in western Sonoma, is made defendant in a suit commenced for the purpose of having the ordinance construed regarding the tents and cottages forming pat [sic] of the rooms of a hotel. District Attorney Clarence F. Lea and Assistant District Attorney Geo. W. Hoyle are attorneys for the people. The decision will settle a much mooted question, and the same will be awaited with interest. Jacob Koblar, a Mt. Olivet man, arrested again on a charge of the violation of the liquor license ordinance, applied for a writ of habeas corpus in the Superior Court on Saturday. He was admitted to ball in the sum of $1,000, which he furnished, and Judge Denny set the hearing of the writ for Monday afternoon at two o’clock. An interesting point will be involved in the decision of the matter, Koblar claims that he is running a club. Notices were received here Thursday from the Clerk of the Appellate Court at Sacramento, conveying the information that the case of The People vs. Connolly had been affirmed by that court. This was a case that recently attracted widespread interest in this county and elsewhere as it involved the right of the people to use the initiative for the purpose of enacting regulations governing the liquor traffic. Subsequent to the initiative liquor ordinance at the election last fall, the Appellate Court in another case held in substance, that the initiative could not be used for the purpose of regulating the liquor business and that the local option law was the sole method of regulating such business by vote of the people. That decision was made in the celebrated Zany case. Its effect was to render the Sonoma County initiative ordinance invalid, should that decision stand. from conducting a retail llpuor business without having a thirty-five room hotel. The suit was based on the contention that the Sonoma County ordinance was legal. This contention of the District Attorney has been sustained. J. E. Pemberton was associated with the District Attorney and his assistant, G. W. Hoyle, in the case. Hon. T. J. Geary and T. J. Butts represented the defendant and R. L. Thompson and Ross Campbell appeared as amicus curiae. An injunction was granted by the lower court. Judge Thos. C. Denny presiding. The defendant appealed to the Appellate Court where the matter was again argued. The attorneys amicus curiae again appeared there and tried to secure a dismissal of the case, which the court denied. The decision follows the habeas corpus in re Ellsworth recently decided by the Supreme Court. The effect of the decision is to hold that the initiative ordinance is valid. The District Attorney has instituted another injunction case in the Superior Court to secure on interpretation of the doubtful language in the ordinance. As soon as judgment is secured in that case it is hoped that the uncertainties of the law will be definitely determined. Superior Judge Denny again sustained District Attorney Clarence F. Lea in his prosecution of the violators of the roadhouse ordinance in Sonoma county, by denying Jacob Koblar a writ of habeas corpus and remanding him into the custody of the Sheriff, yesterday afternoon. Some time since Koblar was arrested on evidence furnished by a detective the District Attorney had employed, that Koblar was again violating the ordinance and a complaint was sworn out and Koblar was arrested and taken before the justice court. He then applied for a writ of habeas corpus, and yesterday Judge Denny heard arguments. When the case was submitted he made an order as stated above. Koblar urged that he was entitled to dispense liquor, as a club, known as “Local Mt. Olivet Social Club,” had been organized at his place, but the District Attorney maintained that he was violating the anti-roadhouse ordinance, club or no club. Judge Denny’s ruling yesterday virtually holds that such clubs as Koblar says he has organized at his place are unlawful. At the opening of the proceedings in Judge Denny’s court yesterday, Assistant District Attorney George W. Hoyle appeared for the People, and Koblar was represented by his counsel, H. W. A. Weske. Attorney R. L. Thompson appeared and asked to be appointed amicus cura and to be associated in the case for the prosecution. He introduced a surprising affidavit in support of his position, going so far as to allege that there had been collusion on the part of the District Attorney’s office in the preparation of the complaint and the attempt was being made, he said, to present the matter to the court in the wrong light. There was some warmth aroused over the unexpected attack of such an affidavit, and when he got an opportunity. Assistant District Attorney George W. Hoyle sternly repudiated the insinuations contained in the affidavit, as did District Attorney Lea later in the day. The court proceeded with the hearing of the matter and during the argument many citations were used and the ordinance and its language frequently cited. The Assistant District Attorney insisted that Koblar’s supposed club was only a subterfuge and that he was plainly violating the provisions of the law and ordinance. Attorney Thompson acquiesced in the remarks of counsel. Attorney Weske, representing Koblar, took another viewpoint. Koblar will have to take his punishment now, that he has been refused the writ. Attorney Thompson also produced affidavits yesterday from two detectives, said to be Pinkerton men, Von Appen and Ring, and who were employed recently by G. J. K. Bigelow in the Sonoma Valley, one of whom is said to have stopped at the Koblar place last Thursday night, and to whom Koblar is said to have imparted information that the liquor interests would try another move if the organization of clubs did not prove effective, and that a wholesale branch would be established for the distribution of liquors at his place, with himself acting as agent. A neat frameup to allow the roadhouses to come back into the county in violation of the spirit of the law and the wishes of the people was nipped in the bud on Tuesday, by Judge Thomas C. Denny of the Superior Court of this county. Attorney Rolfe L. Thompson filed an affidavit in Judge Denny’s Court which has proved a sensation in the charges that it makes. The matter was filed by Attorney Thompson as attorney amicus curae (friend of the court); and shows some startling things in the trial of Jacob Kobler, which was being heard before the Court that day. Upon the result of this trial depended the existence of the roadhouse, it would tell whether the roadhouse could come back into the county despite the wishes and votes of the people or not. There had been a complaint filed in the justice’s court charging Mr. Kobler with selling liquor without a license, this complaint had been drawn up by the District Attorney’s office, and had been sworn to by a deputy sheriff. As shown by Mr. Thompson, the complaint after charging Mr. Kobler with selling liquor without a license stated that he had done so “under the following conditions.” Then followed what was really a defense instead of a complaint. It is stated that a social club had been organized “for the moral and intellectual” uplift of the members: that incidental to the club it kept and sold liquor to its members. Mr. Kobler was the manager of this club and sold the liquor as such manager. After the arrest, Mr. Weske, attorney for Mr. Koblar, applied to the Superior Court with Judge Denny sitting, for a writ of habeas corpus. According to law upon the hearing following the granting of a writ of habeas corpus ‘which hearing is to decide whether there are facts sufficient to hold the prisoner or not), the judge in deciding the matter can only take into consideration the facts stated in the complaint This was a peculiar situation, the judge had only a “defense” to hold the prisoner. In the documents filed by Attorney Thompson, the district attorney’s office is charged with filing a complaint the face of which indicates that it is a portion of a frame-up for the purpose of procuring a court decision to permit road houses to resume business in Sonoma county. Judge Thomas C. Denny stated from the bench that the pretended club of Mr. Koblar should have been proved as a matter of defense and not set up in the complaint by parties who had brought the action. Mr. Thompson had the affidavits of two Pinkerton detectives that had been working on the case for him. The facts as shown in their affidavit, which was read in open court, was startling. It showed that the club had as members among others the Grace Brothers Brewery and the Enterprise Brewing Company of Sebastopol. The by-laws of the club showed that the only requirement for membership was the payment of thirty-five cents, and the majority vote of the “members present;” which of course could mean the members already lined up before the bar. To Detective Ring Mr. Koblar is alleged to have unbosomed himself freely, and in his confidences set forth the coming action of the liquor interests in case the present action did not restore the road houses, and permit the sellllng of liquor. According to the affidavit filed by Ring, and presented by Thompson, should the present “club” of Poblar rove [sic, sic] to be too frail to pass muster in the courts, in the present action, he was to deed part of his property at Woolsey station over to Grace Brothers Brewing Company and the Enterprise Brewery at Sebastopol, and then he (Koblar) was to act as the agent of these corporations. Koblar said to the detective that Bigelow of Sonoma was the only man whom the liquor interests held in fear. “And we further recommend that no licenses be issued simply on the recommendation of one member of the board, in whose district the applicant seeks a license, as has been the custom, but that licenses be authorized by the board as a whole, and not otherwise. “We further recommend that the board immediately proceed to investigate and determine what proprietors of hotels now holding licenses, are actually qualified, and that they revoke the license of those not so qualified. The above recommendation was made by the Sonoma county grand jury in its partial report to Judge Denny in the Superior Court, prior to adjournment ot the call of Foreman Robert Potter Hill, Thursday afternoon. The recommendation was ordered filed by the court. Petition to recall J. H. Weise, Supervisor, First District of Sonoma County, California. We, the undersigned qualified electors of the First Supervisorial District of the County of Sonoma, State of California, demand the recall of J. H. Weise, the duly elected, qualified and acting Supervisor of said district, and that his successor be elected in the manner provided by law. 1. In falling to keep his pledge to confine the issuing of liquor licenses to a minimum, and to uphold the Anti-Roadhouse ordinance. 2. In advising, encouraging and issuing liquor licenses in defiance of the spirit and plain provisions of the Anti-Roadhouse ordinance, to persons not engaged in conducting a bona fide hotel with 35 sleeping apartments properly furnished for guests. 3. In advising and recindlng the resolution of the Board of Supervisors, limiting the number of licenses in a portion of said district, to eleven. It is commonly said that people would rather hear evil than good of their public officials. Whether this be true or false it is doubtless true of some. The credulity that is willing to believe without investigation or just cause to accept unfounded attacks on public officials, furnishes a temptation to the unscrupulous *nd disreputable. Ever since the adoption of the initiative liquor ordinance in this county I have been subjected to unscrupulous persistent, and premeditated attacks, all emanating from a very small coterie of hypocrites. In order that the public may understand the history of this so-called roadhouse controversy and how much merit there is in these attacks, I desire to briefly recite the facts. Shortly after the adoption of the initiative ordinance the Appellate Court of the Third District decided what is known as the Zany case. That case in effect held that the local option law furnished the only means by which liquor regulations could be established. The effect of the decision, if not reversed, was to nullify the initiative ordinance adopted by the people of Sonoma County. The decision, however, was contrary to a former decision of another district court made in the Giddlngs case. Shortly after the Zany decision R. L. Thompson visited my office and urged the institution of a suit to establish the validity of the Sonoma county ordinance, I refused to associate him in such a case, but on my own Initiation I filed the case of People vs. Connolly, which was based upon the theory that the initiative ordinance was legal and if sustained by the Appellate Courts would reverse the Zany case and establish the law for our county. That was the object which Mr. Thompson himself had claimed to desire. After instituting the Connolly case, Mr. Thompson wrote articles in the public press of this county, alleging that the Connolly case was instituted bv me “for the benefit of the roadhouse.” And by frequent insinuations and innuendo sought to create the impression that my purpose was to defeaf the initiative law. Mr. Thompson, through the press, repeatedly informed the public in substance that the Connolly case could not be decided in favor ol the people but would be decided on a technical point. Mr. Thompson neglected, however, to tell the people that the only party directly concerned in that suit, who was trying to evade its decision on the merits, was himself. He has never told the public that when the Connolly case came up for hearing in the Appellate court that he appeared there and tried to secure its dismissal and prevent a judgment sustaining the Sonoma county initiative law, on a purely technical point. After the Connolly case was finally decided, sustaining the validity of the county ordinance, Mr. Thompson, inspired articles written for the benefit of the public, stating that the decision in the Connolly case is “one of the most important cases for Sonoma county that has been decided in years.” The same newspaper articles inspired by himself are full of self-praise and he attempts to appropriate the credit for the very decision which he used every means in his power to prevent. In fact, his attitude in that case, as in the whole roadhouse controversy, has been purely selfish and hypocritical. R. L. Thompson has not been true to the anti-roadhouse cause. He has tried to juggle with the matter for his own aggrandizement, all the while sacrificing the interests of those he deceived into believing he was serving. He has been trying to serve his selfish interests and do a little dirty politics instead of really and in good faith attempting to aid in the enforcement of the law. He has never filed a complaint for a single violation of that law; he has never requested this office to file one. Practically his whole attempt has been not to fight the roadhouse but to try to besmirch and injure the district attorney. Instead of trying to aid and encourage and assist the district attorney In these cases, the public is well familiar with the fact that he has constantly hampered, attacked and obstructed the officers in trying to enforce the law. While the Connolly case was pending Mr. Thompson told me in private that he knew that I stood for decency in public life, and had my best interests at heart. While he was trying to convince me of his faith in me he was at the same time writing articles for the newspapers, trying to convince the public of his lack of faith In me. At the December meeting of the Board of Supervisors, in conformity to my suggestion, the Board of Supervisors refused to issue any license and deferred any motion until January. Notwithstanding the upper courts had rendered no decision on the matter, at the January meeting of the Board, I was instrumental in procuring the Board of Supervisors to adopt the resolution against issuing any license until proof was made to their satisfaction that the applicant had thirty-five rooms, as required by the ordinance. The initiative ordinance provided no penalty for its violation and at my suggestion the Board of Supervisors adopted an ordinance providing a penalty and making it possible for any citizen to initiate a criminal prosecution for violation of the ordinance. As since decided by the Supreme court, the initiative ordinance did not limit the power of the Board in issuing licenses to any person, whether hotel-keeper or not, but only made it against the law “to sell” liquor without a license. The ordinance so adopted by the Board made the initiative ordinance operative when without such ordinance and resolution, it was, from a legal standpoint, practically a dead letter. About the first of the year Mr. Thompson was instrumental in procuring the filing of a suit against the Board of Supervisors, alleging that they threatened to issue licenses regardless of the initiative ordinance, when in truth and in fact he knew exactly the contrary to be the truth. The case was evidently intended purely for the purpose of creating distrust of the Board of Supervisors and myself. When it came to trial he absolutely failed to produce a single witness to sustain his false charge. Judge Seawell immediately decided that the evidence was all one way and the charge groundless. Consistently with his course of duplicity and chicanery, that he has pursued during the last eight months, Mr. Thompson is again trying to convince the public of a conspiracy and collusion of the district attorney in reference to the Kobler case. This time he thinks he has found a mare’s nest. Over a year ago I assisted in prosecuting Kobler before the Board of Supervisors in a proceeding in which his license to sell liquor was taken from him. Complaints have been made of his selling liquor illegally. I caused the evidence to be procured and a complaint was filed against him on that ground on July 23, 1912. The complaint was prepared in this office to which he pleaded guilty and paid a fine of $100. A few weeks ago complaint was again made to this office in reference to his selling liquor illegally. I employed a detective to visit the Kobler place to procure the evidence against him. I advanced the money out of my own pocket with which to pay the detective and pay his own expenses in procuring the evidence. The detective stayed in that vicinity a few days and procured evidence which thoroughly showed that he was again violating the law. I prepared a complaint in my office, charging him with selling liquor without a license. I also prepared search warrant papers and caused proper affidavits to be made for searching the premises and confirm the evidence we already had. This was done at my instigation. The complaint filed in that case was prepared in the usual form, of which we have used many. After Kohler’s arrest I learned from his attorney that he had been advised by an attorney that the so-called “club” system, which he had created, was a defense to our charge. I told the attorney that in my opinion it was no defense whatever. That in my opinion the club was not a bona fide club and that even it it were, under the Sonoma county ordinance, it was a crime for him to sell intoxicating liquor without a license. We stipulated to present the matter to the Superior court on petition for a writ of habeas corpus by the defendant. I prepared another complaint in the same language as the first complaint and further setting forth the character of the so-called club, as set forth in the by-laws thereof, of which we procured a copy. At the time this stipulation was entered into it was distinctly understood that Kobler was to be prosecuted by me for his illegal sale of liquor, even though the Superior Court should rule against us on the complaint under which the defendant petitioned for a writ of habeas corpus. In other words, my contention was and is that every club, whether bona fide or not, is required to have a license before engaging in the business of selling intoxicating liquor, and in the second place, that the Kobler club was not a bona fide club. Under these circumstances the Kobler case came up in the Superior Court, where Mr. Thompson appeared and viciously, corruptly and without the slightest foundation of fact to justify his charge, accused me of collusion with the defendant for the purpose of getting a decision to permit the illegal sale of liquor. Mr, Thompson’s charge was absolutely false. It would be a reflection upon his intelligence to suppose that he did not know that it was false. He did not make the slightest investigation to find out whether it was true or false, because he knew it was false. His action In the matter is entirely due to his inordinate desire for the spotlight and preferment. It Is consistent with his purpose as evinced during eight months of duplicity and deception, to make the road house question a means of serving selfish ends and venting personal spleen instead of acting for the benefit of the community or the public. The question presented on the hearing was whether or not the complaint drawn by me stated an offense against Kobler assuming that all the facts stated therein were true. That was the sole legal question that was decided or could be decided on the hearing. With that question the Judge agreed with the contention of the district attorney and absolutely sustained the position I had taken in the matter. The fact that the decision was in our favor alone explodes all the furore which Mr. Thompson attempts to create. Mr. Thompson displayed his own duplicity in the matter before he left the court room by specifically admitting that the contentions of the district attorney were correct, as a matter of law. Namely, that the complaint showed that Kobler was guilty of the offense charged. Any attempt to use the name of Judge Denny to besmirch me about the matter is absolutely vicious and without justification. I am authorized by Judge Denny to state that by no word or act of his in the case did he mean or intend to cast the slightest reflection upon the district attorney, and that he does not question my motive or sincerity in the case. Both the complaints filed against Kobler recently, on my initiation are still in the Justice Court, and Mr. Kobler will be prosecuted on one of these complaints and the thought of doing otherwise was never suggested to my mind until mentioned In the unscrupulous, scandulous and villianous attack of R. L. Thompson. During the last year Mr. Thompson’s “zeal for righteousness” has prompted him to inspire more than a score of newspaper articles all aimed at questioning my motive; besmiching [sic] my reputation and creating distrust in the minds of the public. What motive is behind these attacks I will submit to the honest judgment of conscientious and intelligent people. It is sufficient to say that the motive is not honorable nor just nor right. I believe It is the duty of every man to preserve his good name for himself, for his family, for his friends and for society. It Is particularly desirable that those in public positions should preserve their good name. But more important than that, it is necessary that they should deserve it. I have been district attorney of Sonoma county for more than six years. Regardless of what any shyster, hypocrite or knave may say, I deserve a good name. I have prosecuted alike friend and foe, rich and poor, and have tried to dispose of every case as its merits appeared to me, regardless of what might be the influence of public clamor behind them. There is not a man on this earth that can state a single specific fact questioning my motive in reference to the initiative law. My motive has been clean and sincere. The door of my office has been open to every person who desired to make a charge and have a case investigated. And those who have questioned my motive have done so in deceived ignorance or maliciously and corruptly, as has R. L. Thompson. I have long since learned that however sincere we may be, we are not exempt from attacks of calumny and detraction. But I want to say that R. L. Thompson, nor any other man can, on oath, charge me with any immoral collusion without committing the crime of perjury. In reply to the personal assault made upon me by the District Attorney, published in the morning Press Democrat, I only wish to say I believe the facts recited do not justify the conclusions of the District Attorney, nor the language in which the article is couched. The public is perfectly familiar with the road-house litigation, and I shall not weary them by reviewing it from my standpoint. Everybody knows that Attorney Ross Campbell and myself were engaged and acted as counsel in behalf of the ordinance. Everyone knows that in every proceeding in which we appeared our contentions were upheld by the highest courts of the state. This fight was against the road-house, and not against the District Attorney. So far as answering the personal charges made against me, it seems neither worthy nor necessary. Nearly a year ago the people of Sonoma county voted by a large majority to close the saloons outside of incorporated towns and cities. They did this under the initiative law and not under the Wiley iocal option law. Bonafide hotels of the county possessing thirty-five or more rooms were exempt from the operation of the law. At once a contest was begun to defeat the will of the people. The matter was held up in the courts for months, till finally the State Supreme Court passed down a decision sustaining the validity of the ordinance in every essential particular. No sooner had the law been upheld by the Superior Court of this county than the liquor interests began their work to encompass its defeat. Not fair and open opposition, but by clandestine methods, by technical flaws and by positive evasions of the law. The first evasion was the thirty-five-room hotel clause. In some instances tents were put on the premises, far away from the main building, and counted as “bed-rooms.” In other instances old machine shops, back rooms of furniture stores, were curtained off by cheese cloth and counted as bed rooms. Ihe dog house, the stable and chicken roosts were put in when necessary to make up the thirty-five rooms. Now, the strange thing to us, is that these things were allowed and no investigation instituted. It is not sufficient for a man to go before the Board of Supervisors and swear that he has a bonafide hotel of thirty-five robms. The officers of the law should investigate thees cases and see if the applicant is telling the whole truth, and nothing but the truth. Since the Supreme Court decision, other methods ot evasion have been resorted to. The “Club” system has come into vogue. That club system is nothing more nor less than a system to shield drunkenness and gambling. All the big cities are going after it with hammer and tongs and the next legislature should wipe it out in California. In the Kobler case now before the courts of this county, about which so much bad blood has been brought to the surface, it is clear to all that the Kobler club is a fake; that it is backed up by wholesale liquor interests in this county; that these wholesale interests are the real offenders of the law. That there was a deep laid scheme to defeat the roadhouse law is plain on its face, whether or not there is any collusion by county officials. The people see it as Judge Denny saw it. As to the bout between R. L. Thompson and District Attorney Lea, that’s to be regretted. They are both good men, but boys, and boys will scrap sometimes. Mr. Lea has made a good district attorney, and Rolfe L. Thompson has been the people’s friend in this entire roadhouse fight, and the people will stand by him, for he justly holds their fullest confidence. At the meeting of the Board of Supervisors yesterday action was taken in the matter of the E. E. LaFranchi liquor license at Monte Rio, a hearing concerning which was given at last month’s session. The evidence was not deemed sufficient on which to take away the license. The Supervisors have decided to amend the liquor license ordinance so that it will provide that dance halls cannot be located in the same building in which a saloon is conducted. It is believed that this step will put an end to future complaints. Men, women and children from Freestone crowded Supervisor’s Hall yesterday morning and afternoon, interest centering In the hearing of the application of George W. Stump for a retail license for a saloon in that place. The petition asking the Supervisors to grant the license was offset by a larger protest signed by over one hundred names. There were a large number of children present, including a number of white-dressed girls. They accompanied their elders ahd same of them had temperance bannerettes. From statements made it seems that the saloon question has been a much discussed one in the Western Sonoma village, and there is apparently a determination to do away with a drink emporium for good. After the Supervisors had listened to the evidence a vote was taken and the license petitioned for was denied. A suggestion that an election be held in Freestone precinct to determine the matter by vote was made. This was not accepted. It seems there was no objection to the man applying for the license but the protestants did not want a saloon at all. Practically the entire population of Freestone came to town yesterday to witness and participate in the proceedings, They made the corridors of the county courthouse quite lively. Some time since the Supervisors denied the petition for a license for the Ward hotel, which had the requisite number of rooms required by the ordinance. In that case, as in that of Mr. Stump, there was a large protest against a saloon license being granted. …The case of Supervisor Harry Weise, whose recall is how being sought by certain persons residing in that district, offers an instance fairly in point. Mr. Weise was elected last year on the Republican ticket, defeating a man who had been long in office and who had served his district well. The matter of saloon regulation came up, and Supervisor Weise offered a resolution limiting the number of saloons within a given territory. This resolution was adopted by the Board. An ordinance was also submitted to the people and duly adopted at a regular election, providing that summer resorts having not less than thirty-five rooms be allowed to procure licenses. Applications under the new law developed the fact that it and the resolution adopted by the Board were clearly in conflict, whereupon Supervisor Weise moves that the resolution be rescinded, very properly holding that a mandate from the people is more binding than a mere resolution adopted at a meeting of the Board of Supervisors. Tents cannot be included In the “thirty-five separate sleeping apart apartments,” which hotels, outside of incorporated towns, must have in order to operate under a retail liquor license as contemplated in the provisions of the anti-roadhouse ordinance adopted by the people in Sonoma county last November. Superior Judge Emmet Seawell so decided in an opinion handed down yesterday morning in the suit of the People vs. P. S. Newton. Newton is proprietor of Moscow hotel, on the Russian river. Most of the rooms ot his hotel are tents and when he was granted a license District Attorney Clarence F. Lea brought the action in court to settle the question as to whether a tent could be regarded as one of the hotel rooms mentioned in the ordinance. Judge Seawell’s decision yesterday sustains the contention of the district attorney. In his opinion yesterday, Judge Seawell overruled the demurrer interposed by Newton’s attorney and the ruling made forfeits the right of Newton to run a bar in connection with his summer resort. At first hand the opinion in the Newton case seemed to contain an intimation that Judge Seawell would also construed a “cottage” in the same light as a tent. The report that such was the case caused considerable consternation as such a ruling would have meant the closing of practically all of the prominent summer resorts in Sonoma county, many of them old established and with permanent cottages making up the required quota of rooms and more. The question of tents was the only one passed upon by Judge Seawell, as he himself stated when interviewed last night. The question of cottages was not passed up to him for judicial determination. Anything said inferentfally in the opinion, the Judge said, must not be taken in the nature of a judicial determination as to cottages. All he passed upon was in relation to tents. The other question, he said, would involve more serious consideration. The amended county liquor ordinance prepared for passage by the Board of Supervisors makes a number of important changes. One change specifies the kind of rooms that come into the reckoning in the “thirty-five separate sleeping apartments” a bona fide hotel, such as is contemplated by the initiative anti-roadhouse ordinance. The new ordinance provides that said rooms must be built of wood or permanent material and must contain 500 cubic feet of air space and 8 feet of window space. The use of tents, as is already known, is forbidden under the recent decision of Judge Seawell, from being included in the thirty-five rooms necessary. When the new ordinance becomes effective no dance hall or platform can be located within fifty feet of a bar in a bona fide hotel, the only places that can get a retail liquor license under the initiative ordinance. Under the new ordinance no manufacturer of vinous or malt or other intoxicating liquors, or their agents, can sell less quantities than thirty gallons; and not less than one gallon, when sold to any person who is the holder of a retail license, or to any person who has not been a bona fide householder of less than six months in the locality in which the hotel is located. This will do away with the selling of beer or wine to transients, about which there has been considerable complaint, particularly in five-bottle draughts. There is also a change in the form of application for a license. Future applications must be signed by eight of the nearest bona fide resident householders who have been such for six months prior thereto. With instructions to the sheriff to investigate every hotel in the county outside of incorporated cities, the Board of Supervisors Saturday morning, just before adjourning the September session, passed an amended liquor ordinance, which does not in any way conflict with the initiative ordinance, but does strengthen it by providing penalties and defining just what constitutes a hotel room and in fact what constitutes a hotel building under the suburban classification. The ordinance is a rigid one and was passed with the intention to make it as hard as possible for any one to violate the liquor law of the county, and at the same time to deal fairly with all reputable and respectable summer resorts of the county. Persons who sell near beer and soft drinks are forbidden to keep a stock of liquor on the premises, or within ten feet of the premises where the soft drinks are sold. Supervisor Harry Weise by his attorney, William F. Cowan, filed a suit Saturday morning In the Superior court against Guy G. K. Bigelow, seeking $65,000 damages for defamation of character and slander. The suit is the outgrowth of statements alleged to have been made by the defendant in the present recall campaign directed against the Supervisor in the First District. The statements to which Supervisor Weise takes exceptions were said to have been uttered by Bigelow at a meeting of the Cotati Ladies’ Improvement Club last Monday night, September 8. The complaint consists of three specifications. Two relate to charges which Bigelow is said to have made in which he declared that Supervisor Weise accepted a bribe in the matter of the Fetters Springs liquor license. The complaint quotes the language Bigelow 1s said to have used on that occasion while discussing the question in which he admitted that he did not have the necessary proof to back up his allegations and innuendos. The third specification charges Bigelow with having said that Supervisor Weise admitted to him that he was boozy, meaning he was drunk, during the sessions of the Board, and that he was thus influenced to vote for the license. The plaintiff asks $25,000 on each of the first two counts and $15,000 on the third. Supervisor Weise, needless to say, absolutely and unqualifiedly denies every allegation and imputation in the statement as made and says every one should understand that the charges are campaign slanders, designed to blacken his character in the hope of affecting certain votes in the recall election next Tuesday. Attorney Cowan, after filing the suit, declared that it would be pressed to an issue as early as possible and vigorously prosecuted, as it was the desire to prove that a man’s character could not be assailed without the least cause unless the assailant paid the penalty. Guernevllle Times: The Pool Brothers, John and Charles, have started out in good earnest in building their new hotel. Bright and early last Monday morning a force of men were put to work clearing the grounds preparatory to building. The hotel is to be on the present site of the Louvre and the hotel will have a fine frontage of sixty feet on Railroad avenue. It is to be a two-story building and to contain thirty-eight rooms. The construction will be in charge of Willard Cole as foreman and the work done by day’s labor. The first carload of lumber arrived on Wednesday morning and all the local men available will be put to work on the job immediately in order to rush the work to completion as early in November as possible. In his answer filed in the Superior court in the $65,000 damage suit brought against him by Supervisor J. Harry Weise for slander and libel, Guy J. K. Bigelow enters denial to practically all the allegations contained in Mr. Weise’s complaint, regarding the public utterances he made ridiculing the Supervisor from the First District at meetings held during the recall campaign. Denial is also made by Mr. Bigelow regarding the “arrival of a sack of money” following the granting of a liquor license in the Sonoma Valley. A lively fight is promised when the suit comes to trial. Both sides will have many witnesses and owing to the bitterness of the campaign which eventually returned Supervisor Weise to office, or rather prevented his being ousted, as Bigelow wanted, much interest will be taken. R. L. Thompson is the defendant’s attorney filing the answer to the complaint. A number of matters of business were transacted by the Board of Supervisors at an adjourned meeting at the Court House on Saturday. Chairman C. B. Patteson and Supervisors Weise, Hutchinson, Green and King were at their desks. Clerk W. W. Felt Jr., as usual, attended to the clerical work. There being no opposition to the following applications for renewals of retail liquor licenses for the ensuing year, the same were granted: H. A. Richardson, Stewart’s Point; Morris Levy, Glen Ellen; George. G. Freeman, Geyserville; W. L. McCray, McCray’s; John O. Mclntosh, Penngrove; M. A. Carr, Monte Rio; E. E. Lafranchi, Monte Rio; Theodor Richards, Agua Caliente Springs; Enrico Forni, Vineburg; Ben Meyer, Embarcadero; Harry Wilkins, Glen Ellen; F. E. Haynes, Duncan’s Mills; Brooks & Davie, Camp Meeker; Henry Koerner, El Verano; Mosso & Blanchini, Sonoma Grove; O. C. Benjamin, El Verano; Fetters Hot Springs Company, Fetters Springs; Louis Lamotte, El Verano; John Lopus, Cotati; J. D. Connolly, Occidental; F. M. Haley, Agua Caliente; Phil Rossi, El Verano; Boyes Hot Springs, Hot Springs; Tom W. Tull, Kawana Springs. The license for Mark West Springs was transferred to John O. Wickham. The Russian River resort scene had been growing steadily for more than a decade, with a new place or two opening every year. If you wanted to get away for a few days to swim and paddle around in shallow water or even just lounge away like a sloth in a tent-cabin, it was the best spot in the Bay Area. Although many resorts were more or less the same, some filled a particular niche. Mirabel Park was popular with groups holding Sunday picnics, Camp Vacation (near Bohemian Grove) had tennis courts, and so many Santa Rosans descended upon Rio Nido that it seems much of the town was there at some point over the summer, judging by the frequent notices that appeared in town papers. That history was discussed in an earlier offering, “When we Summered in Lost Places,” and all that continued, as shown in items below. So what made 1910 different? For starters, it was the first season after the Northwestern Pacific (NWP) line finally connected with the narrow gauge railway coming up the coast. 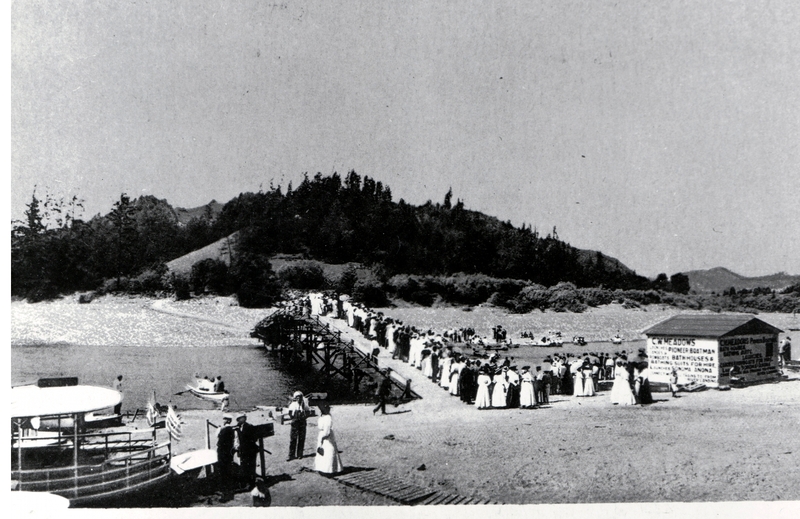 This meant someone in San Francisco could reach the most popular resorts at the west end of the river – Camp Vacation, Monte Rio, and that year’s new hot-spot, Monte Cristo – without taking the NWP to Fulton and changing to the slooooow river local that crawled along with over a dozen stops along the way. This was also the year that electricity came to the resorts, so roughing it was no longer quite so rough. Work on the big fill at Monte Rio, where the broad gauge and narrow gauge trains will meet, is progressing rapidly. A large gang of workmen are employed at the present time, and the railroad company has run a trestle out over the slough where the fill is to be made, so that it will be an easy matter to dump in earth and arrange for reclaiming a valuable spot. The new depot site will be on this spot where the fill is being made, and the Northwestern will reach the depot with a graceful curve on the east, while the North Shore train will come in on the west side of the depot. There is considerable work to be done there before the new depot site will be ready. Other improvements are being carried out at Monte Rio and Rio Campo and a work train is being also used. Things are lively there now, in preparation for the coming vacation season. The railroad companies expect to do a great business this summer in hauling visitors to the redwood section. All of the resorts along the river are planning improvements, and are anticipating entertaining the largest crowds in their history during the coming months. There is no question but the redwoods section about Guerneville is the most popular places in the entire state for summer outings. The Russian River Light and Power Company has begun stringing wires on its poles recently set leading from Sebastopol to Monte Rio. This will furnish electric current for all the resorts on Russian river which require it. The wires will all be placed and ready for the turning on of the current on June 1st. The actual work it is estimated can be done in about fifteen days. From Monte Rio the wires will be run at once to Occidental, when the work of setting the poles has been carried out. Contracts have been entered into with the Westinghouse Electrical Company for the transformers required and the secondary work is to be done by the Metropolitan Electrical and Construction Company of San Francisco. “Monte Cristo,” the Frank Leppos county home on Russian river, was thrown open last Monday by Mrs. Leppo for the entertaining of the ladies composing “The Spreaders.” The club members were delightfully entertained and returning to town gently pleased with the outing. The formal opening of Monte Cristo, Frank Leppo’s splendid new summer resort on the Russian river, will be one of the events of the season in that section. The Santa Rosa band will furnish music for the dance, and this is a sufficient guarantee of the excellence of the terpsichorean revelry. All the arrangements for the pleasures of a large attendance have been perfected by Mr. Leppo, and he has left nothing undone which could in any manner add to the pleasure or comfort of his guests. Busses will be run from Monte Rio’s hotels to the new resort, in order that patrons may be in attendance at the dance and those who wish to go from this city to attend can find accommodations at the Monte Rio hotels. Monte Cristo is one of the prettiest places on the river, and all who have visited it are delighted. There are many handsome cottages on the grounds, and it has leaped into popularity with rapid strides from the first. Indications point to a large crowd being present at the dance, and that they will have a jolly time is a foregone conclusion. The dancing platform is one of the best on the entire river, and has ample floor space to accomodate large numbers of dancers. Mr. Leppo will give his personal supervision to the grand opening ball, and he knows how to conduct elaborate affairs. Mr. and Mrs. Harry L. Hall and Mr. and Mrs. Ney L. Donovan are spending the week-end at Monte Cristo, the country place of the Frank O. Leppos, and attended the ball in the evening. Mrs. James W. Oates and her guests Miss Myrtle Hamell and Mrs. Martel and Mrs. Blitz W. Paxton were among the visitors at Monte Cristo on Saturday and spent a delightful day. From all accounts the picnic of the Irene Club at Rionido must have been one of the most enjoyable ever. It occurred last Wednesday and the members left this city on the morning train and carried with them well-filled luncheon baskets. The lunch was made up on innumerable dainties for each member contributed to the feast. I was assured by one of the Irenes after this manner: “The Irenes can cook and don’t you forget it.” Delighted! Cooking is a very useful and necessary accomplishment. The exhilarating weather, the swimming and the hiking and the pleasures of the outdoor life were all features of this never-to-be-forgotten outing at Rionido. At noon everyone was perfectly ready for the meal, which was spread in the dining room at the bungalow of Mrs. Charles A. Wright, Mrs. Wright being a charter member of the Club. During the enjoyment of the many courses of menu there was much laughter and merriment. some of the members returned home in the evening while others remained overnight with friends and returned the following day. The year 1910, from all present appearances, is going to be one of the most profitable that the owners of resorts along Russian river have ever had. Already thousands of campers are at the different places and daily more are arriving. After the Fourth of July it is expected that a great many more pleasure and recreation seekers will journey to the famous river. The popularity of the river as a place of amusement is easily attested by the fact that nowhere in California may the same amount of travel be found for such a short run. The trains coming from the resorts on Sunday carried about 18 coaches and two engines, the coaches being crowded. From one end of the river to the other people come to seek places to spend the summer months. As a place of recreation it would be hard to find one that could surpass it. San Francisco go there by hundreds to enjoy the bathing. Each day sees the river crowded with bathers. Extra precautions are being taken this year to prevent casualties. Expert swimmers have been stationed along the different places and they keep a constant look out over the people. Not only is it a place for bay cities people, but Sonoma county [garbled typesetting] parties it would be hard to surpass. Many board the train from the cities along the route and attend the dances there on Saturday evening and spend Sunday bathing and boating. Many new boats have been added to the supply by the different resorts and at times the river is crowded with the little craft. Passengers in their raillery have often said that the resorts are so close together and the trains so long that the engine is at one station before the rear coaches have passed another. A number of resorts are making preparations for the Fourth of July. Hundreds of people will go to that section to enjoy the two days’ vacation and adequate quarters will be provided. Many of the camps will celebrate with exercises, while a majority will confine their sports to a grand ball in the evening. Socially this week has certainly been the calm before the storm. 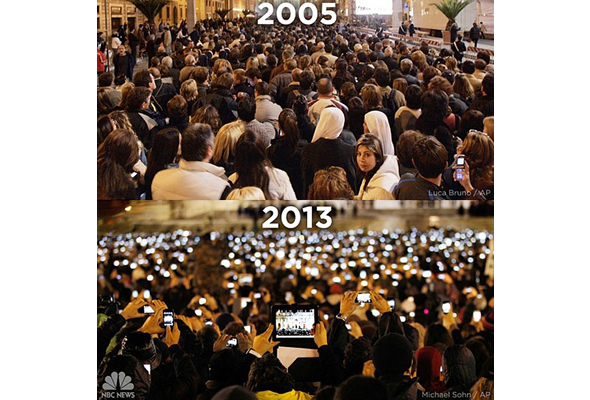 After those memorable seven parties in nine days people have been taking a breathing spell. The bungalows on the river and the cottages at the seaside are the strong attractions now. Summer is on.